A selection of costumes and props was brought into the Vicarage last week and residents, staff and relatives all had a chance to try on and have some fun, some residents were able to feel the different textures between the wigs, the fur costumes and the straw hats. There was even an opportunity to ride an ostrich! 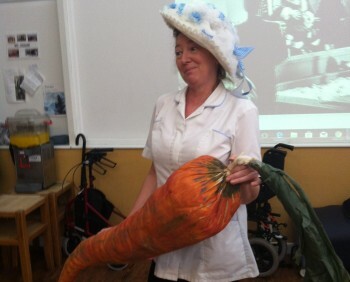 Props ranged from a giant stick of blackpool rock and a Giant carrot seen here being held by care assistant Vanita Rocke. 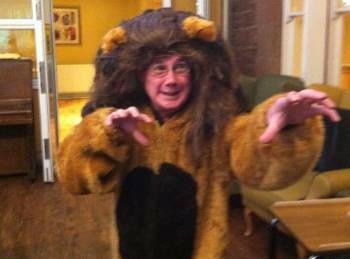 While one of the relatives Mr Steve Griffiths took it upon himself to become the cowardly lion from the Wizard of Oz, even though he was wearing Mummy bears suit and the beast’s headdress from Beauty and the Beast! We appreciate everyone joining in and would like to thank them for making it such a happy and enjoyable afternoon.